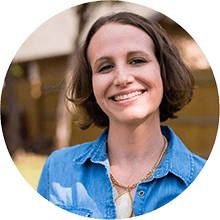 …like when restaurants mess up fried rice, breakfast burritos, pork chops or overcook fish (Wait — I haven’t complained about the fish yet? — give it time). Well, for me, egg rolls should be added to this (ever-growing) list. Too often, I feel, restaurants mess up egg rolls by (1) not caring about the flavors or quality of ingredients going into them and then (2) thinking the deep fryer will fix all their problems. And, yes, I have — apparently — put a lot of thought into this. 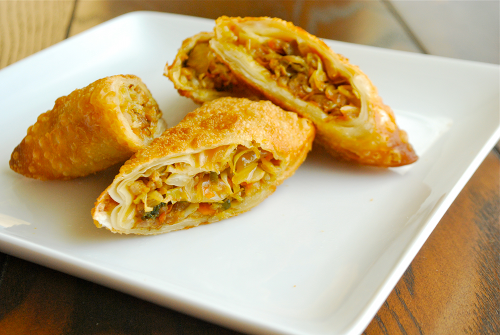 Think about it: Have you ever had a good egg roll? If so, what made it good? For me, a good egg roll is full of fresh vegetables, well-cooked, seasoned meat and has a light, slightly chewy — yet crunchy — fried wrapper. And, you know what? 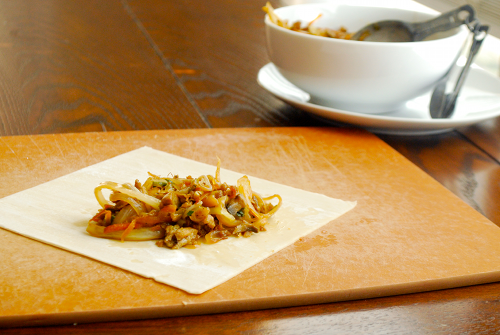 It’s really not hard at all to make egg rolls. 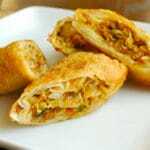 In fact, once you know how to make egg rolls, you can try all sorts of different fillings to see what you like best. 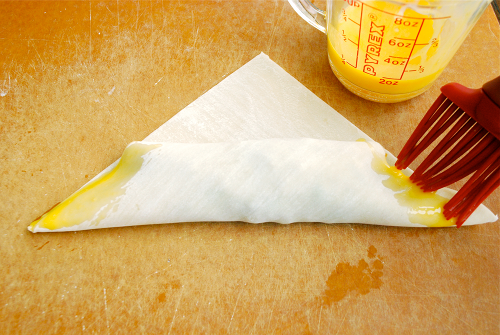 On a clean, flat surface, place 1 egg roll wrapper with 1 corner facing you (FYI: If you prefer chewier egg rolls, like I do, use two egg roll wrappers instead of one — using just one will make the egg roll more crispy). Place approximately 1-2 tablespoons of the filling (see recipe below) about 2 inches from the bottom corner of the wrapper. Fold the bottom corner over the filling. Firmly roll the filled wrapper half-way up the rest of the wrapper. Dab the exposed edges of the wrapper with a beaten egg. Fold the two sides over the filled roll. 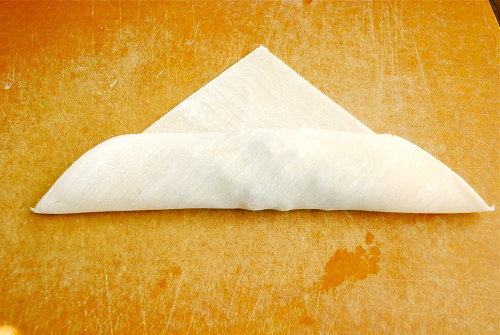 Roll the rest of the way up, pressing the top corner firmly onto the egg roll to seal it. Repeat for the rest of the wrappers. Once ready to cook, heat about 3/4-inch to 1-inch of vegetable or canola oil over medium-high heat in a large skillet or wok. Once oil is hot (you will know it’s ready when a very tiny amount of water dropped into the oil dances and sizzles), carefully place enough egg rolls to cover the bottom of the pan. Try not to crowd them. Fry until golden brown on both sides, about 1-2 minutes per side. Once golden brown on both sides, remove and drain on a plate lined with paper towel. Here's how to make egg rolls that are full of fresh vegetables, well-cooked, seasoned meat and light, slightly chewy yet crunchy fried roll. 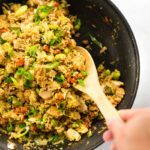 In a large skillet or wok, heat sesame oil. Add and cook pork over medium-high heat until well-browned, about 8-10 minutes. Remove from pan and reserve drippings. Set cooked pork aside. 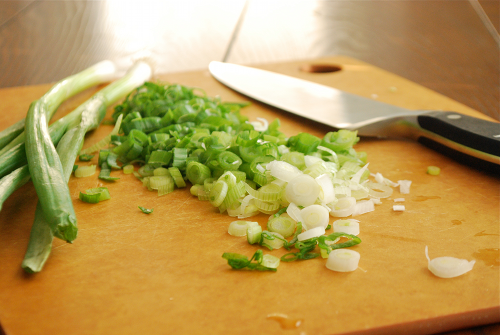 Add cabbage, green onion and onion to the skillet and cook until tender, about 5-8 minutes. 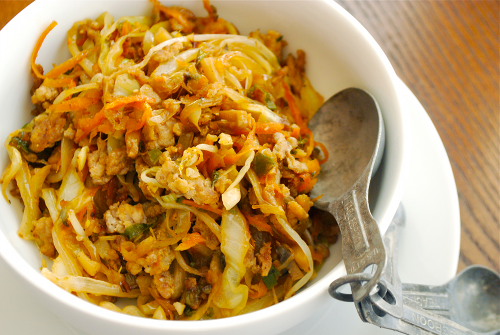 Add water chestnuts, mushrooms, bean sprouts, carrots, garlic, soy sauce and sugar and stir to incorporate. Cook 2 minutes. Add the cooked pork and stir again to incorporate well. Cook an additional 5 minutes. Remove from heat and let cool. 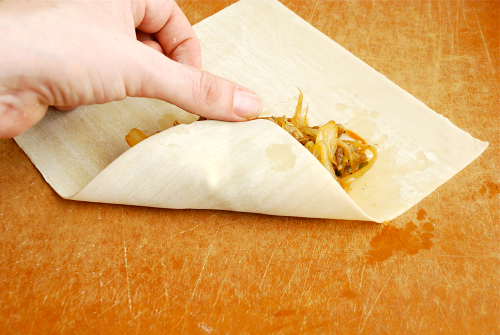 On a clean, flat surface, place 1 egg roll wrapper with 1 corner facing you (FYI: If you prefer chewier egg rolls, like I do, use two egg roll wrappers instead of one -- using just one will make the egg roll more crispy). Place approximately 1-2 tablespoons of the filling (see recipe below) about 2 inches from the bottom corner of the wrapper. 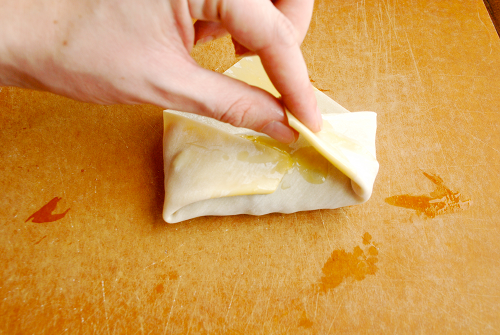 Fold the bottom corner over the filling. Firmly roll the filled wrapper half-way up the rest of the wrapper. Dab the exposed edges of the wrapper with a beaten egg. 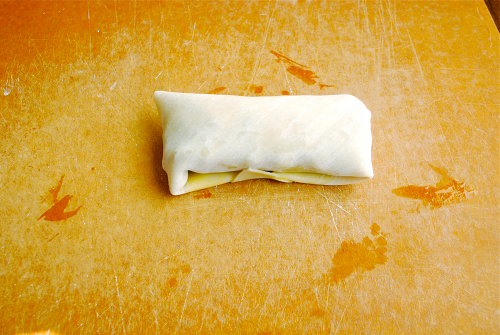 Fold the two sides over the filled roll and roll the rest of the way up, pressing the top corner firmly onto the egg roll to seal it. Repeat for the rest of the wrappers. Once ready to cook, heat about 3/4-inch to 1-inch of vegetable or canola oil over medium-high heat in a large skillet or wok. Once oil is hot (you will know it's ready when a very tiny amount of water dropped into the oil dances and sizzles), carefully place enough egg rolls to cover the bottom of the pan. Try not to crowd them. Fry until golden brown on both sides, about 1-2 minutes per side. Once golden brown on both sides, remove and drain on a plate lined with paper towel. These were delicious! I didn’t find the cremini mushrooms at my store, and I deliberately left out the bean sprouts. I did everything else exactly as noted and these turned out great. Thanks for sharing!! You buy the eggroll wraps already prepared in the fresh vegetables department at your grocery store. 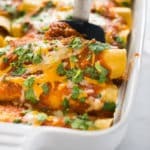 1) Found you through Pinterest.com, this recipe has been making the rounds. 2) Made your recipe, minus the waterchestnuts (as I do not care for them) and AWESOME. Thank you for taking the time to post this recipe and provide such clear pictures. You made egg rolls easy instead of mysterious and they were amazing and have already been added to my personal cookbook of things that I will make frequently. Hi, Lacey, I heard that Canola oil is hazardous to health and shouldn’t be used. Can you please suggest me any better oil for the rolls to be fried. And I like your site so much and a regular visitor too… Love the way you make us cook….Thank you. However, if you’d feel more comfortable using a different type of oil, I’d recommend using Vegetable Oil for this recipe. Please let me know if you have any further questions or concerns. Hello Lacey! 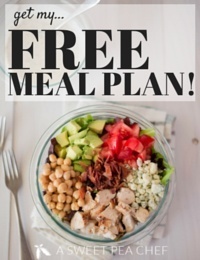 I just wanted to drop you a note saying how WONDERFUL this recipe was! My family and i devoured them last night they were so delicious! Thankyou for sharing, your blog is fantastic and so are the photos! 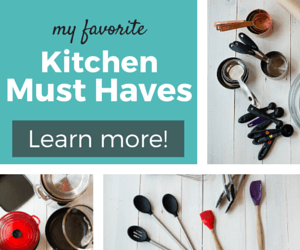 I look forward to browsing some more and finding more scrumptious recipes to try! Yay! I’m so happy to hear you and your family enjoyed the egg rolls 🙂 Thanks so much for your support! Hey Lacey! I was wondering the same thing about the sesame oil. I am going to make these this week. I made the breakfast burritos today and they were a hit. 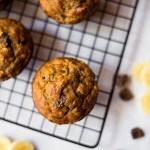 I have made the orange scented muffins twice with a little variation (cream cheese filling) and the kids and hubby have went nuts! I am sooooo glad that I have found your site. Oh and I made the beef stew yesterday for my Aunt and Uncle and it was another hit. I can not wait to purchase ramekins and try your creme brulee! Everything that I have tried so far has been amazing. 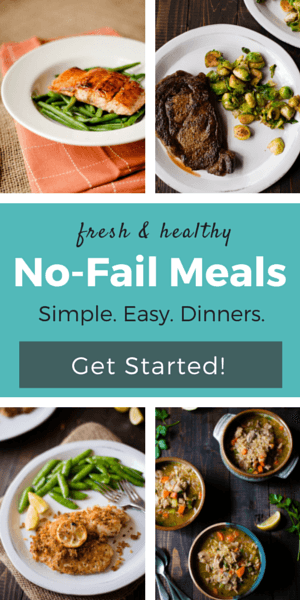 Your recipes are fantastic! 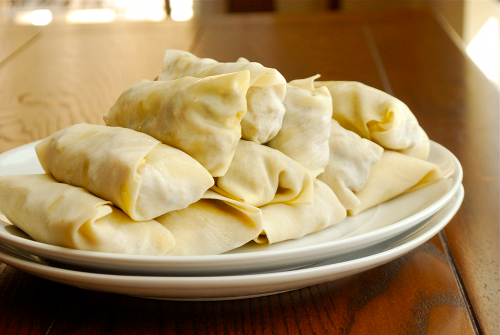 Hi Lacey, I just got done making these Delicious looking egg rolls. 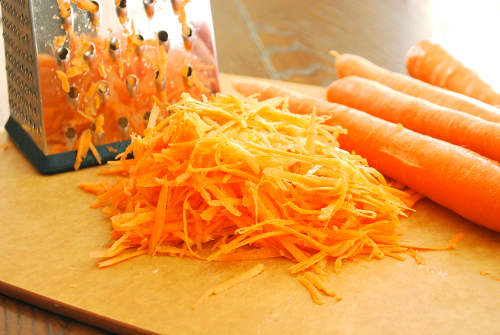 But I noticed that you don’t mention when to put the carrots and seasame oil in, so I kinda played it by ear. I also noticed that if you only use one wrap they they rip alot easier, you’re right! it’s best to use 2 wraps per. Eek! Thanks for catching that, Georgette! I have made the changes to the recipe. I hope you enjoyed the egg rolls! Hi Mitch! Very good question! I decided to do some research to answer this for you and found Jaden at Steamy Kitchen says, “Make sure you get the correct egg roll wrappers. They should be FROZEN and very thin, almost paper thin. Do not use egg roll wrapper found in the refrigerated section (usually near tofu) in Western supermarket – they make starchy, thick, gooey egg rolls with big bubbles on outside when you fry.” Guess we’ve both been buying the “wrong” wrappers. I hope that helps! Jaden has a great tutorial on how to make egg rolls as well in case you’re interested. I’m getting ready to make these egg rolls! Can’t wait! But the wrappers you are referring to are Spring Roll wrappers! Hi Sarah — I’m not sure what you mean by your comment…? The wrappers I use say “Egg Roll Wrappers” on the package. Hi Lacy, was checking out your post and saw this question. 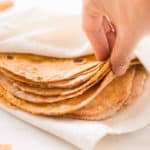 There stereo types of wrappers, the one you use in your recipe and the very thin ones you mentioned. 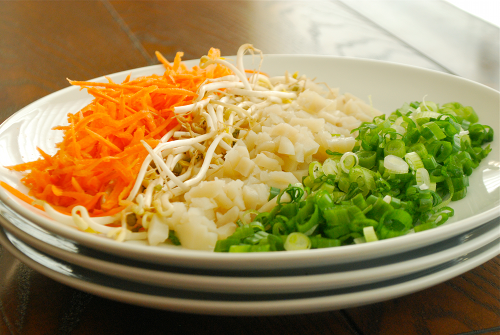 The thin ones are often used in restaurants for spring rolls. Basically just a smaller version of eggrolls. Problem is they are much more difficult to use as you have to wet them first and they rip very easily if you aren’t careful when rolling. I hope they make the grade, Autumn! They look too good to be true. This is very true, Mark ;). Thanks! 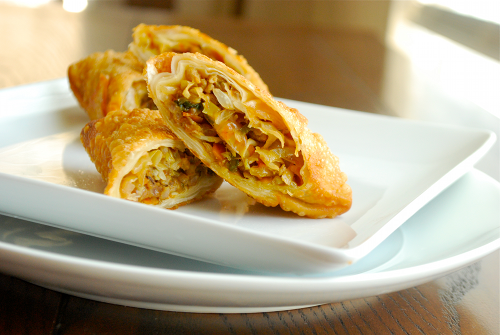 Those egg rolls look absolutely perfect. You have a lovely hand, btw. So enviably delicate. I’m bookmarking this recipe. It’s been so very long since I’ve made my own eggrolls. Yours look fabulous. My favorite restaurant eggrolls are in Houston in a small family-owned Chinese place. They’re filled with shredded cabbage, smoked pork and lots of fresh cracked black pepper. They are packed with flavor! I order two of them with a bowl of their hot & sour soup, which is also world class. I think I may have to try my hand at eggrolls again soon. Thanks for the inspiration! Thanks, Jeanne. If/when I make it out to visit Houston, I will need to get the name of that restaurant! Hi new mommie! I hope you are enjoying this special time. I have a quick question regarding egg rolls – your post is very timely. What I’d like to know is if egg rolls can be frozen. I want to make a big batch and freeze them to pop out anytime to warm up. Will they freeze well? Also – can they be baked instead of deep fried? Hi Lisa! I did some searching, as I’ve actually never tried freezing the egg rolls (though I’m loving the idea!) and found that you can definitely freeze egg rolls. If you do freeze them, you don’t need to defrost them –- just place them in the hot oil, frozen, and add an additional 1 -2 minutes to the frying time. 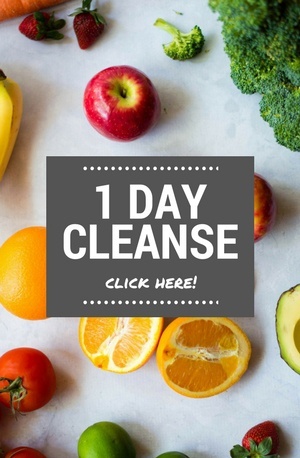 I’d love to know how they turn out if you try this 🙂 Good luck and enjoy!